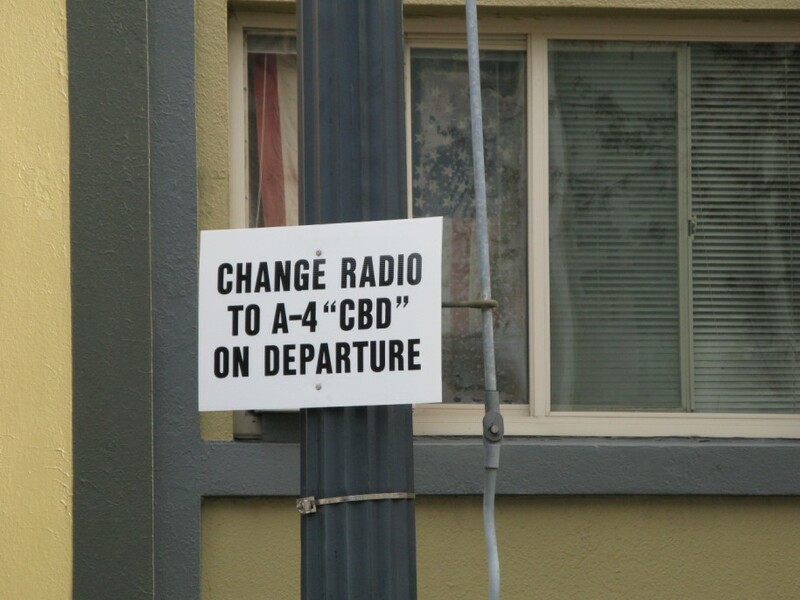 Oh yeah, and on a completely different topic, the new radio signs are up. I’d first seen the prototype in Ruby Junction a while ago and now they’re live, for lack of a better word. I like them – they look better than the temp version that’s been up for the last year since the mall alignment opened. And no, I don’t have pictures of all of them. Yet. 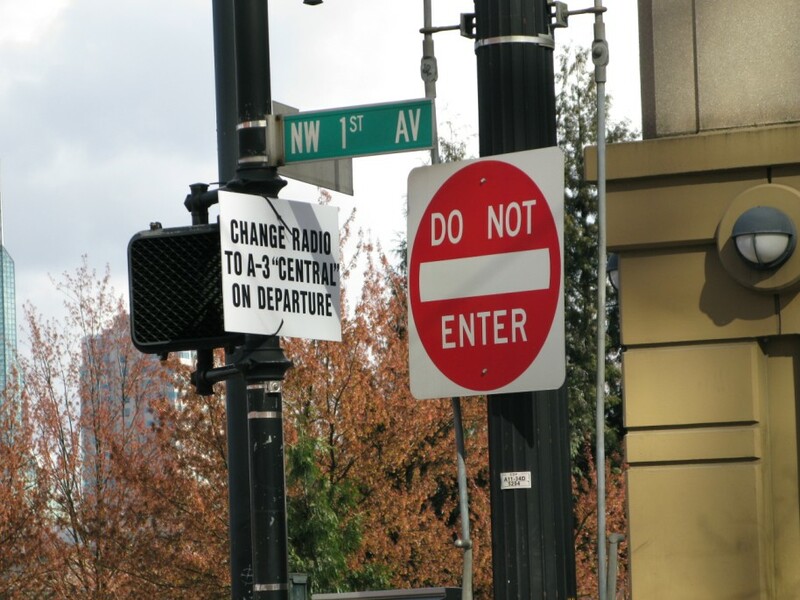 But I probably will eventually since I already have pictures of two versions of the older sign configurations. Just to have a complete set and all, or at least as complete as it’s been over the duration of my time with TriMet. It’s like my own little museum of signs. Or something. 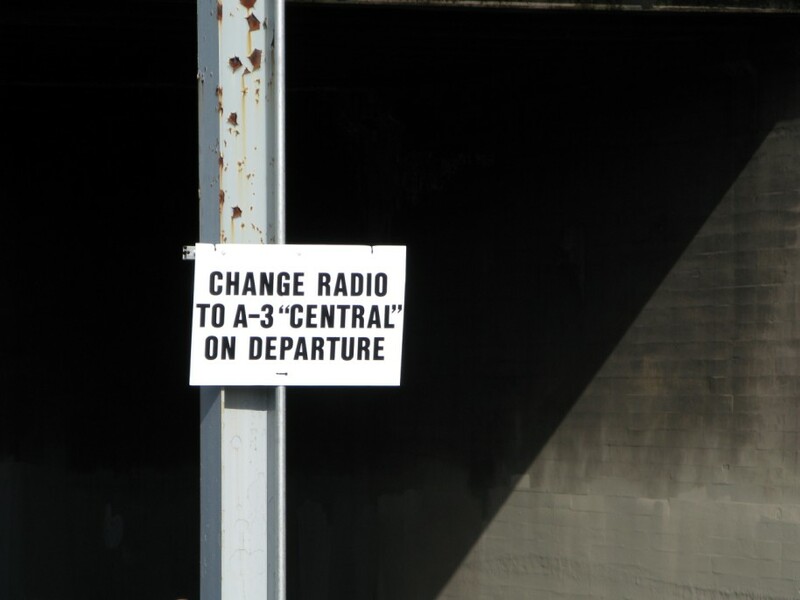 Question: What are those signs by the train platforms with things like “Main 1” or “A-3 Central”? 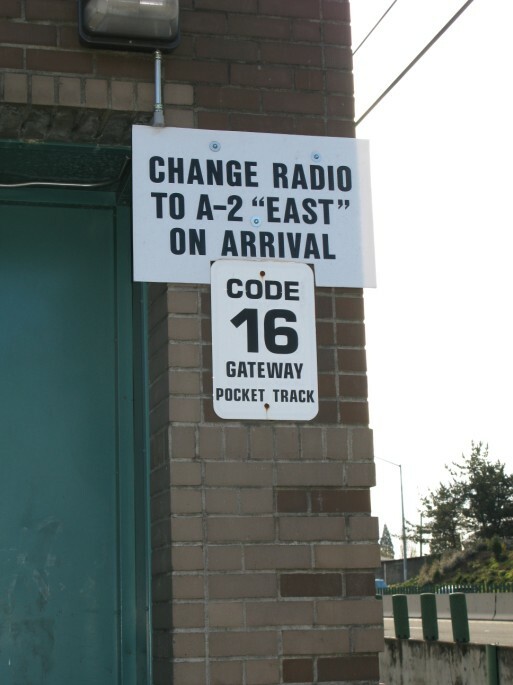 Those are reminders to operators to switch to the correct radio channel for the area they are in. 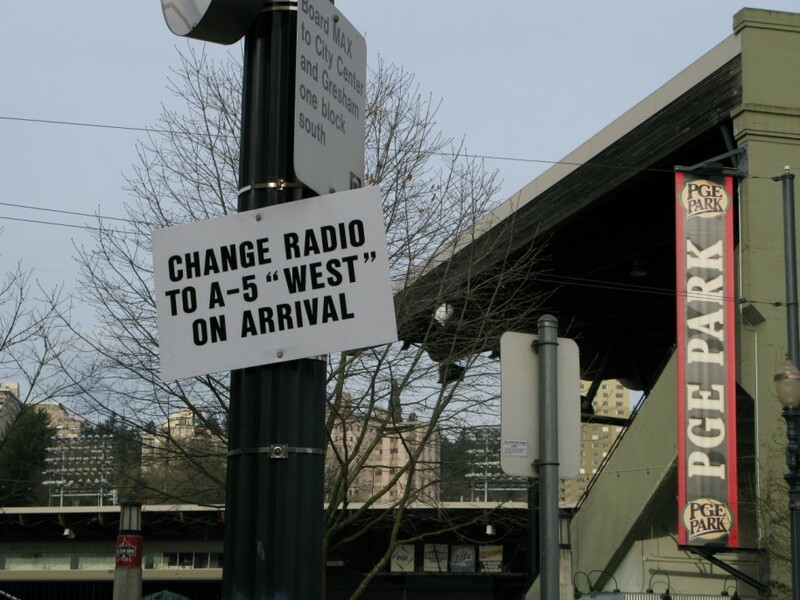 The primary method of communication on MAX is over the open-air radio. 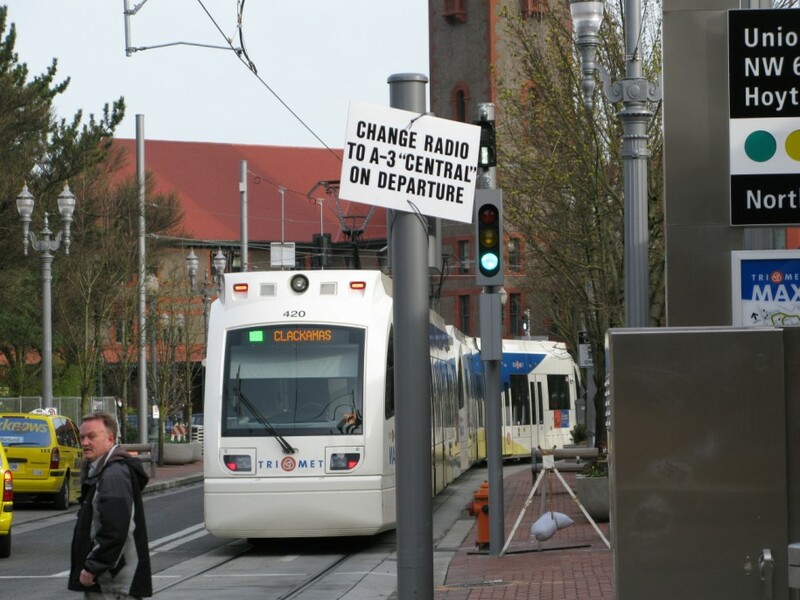 Operators, Controllers, supervisors, field maintenance workers, etc all use the radio, and since the area serviced by MAX is so large, radio coverage is broken down into channels for each section – since an operator who is only doing the Yellow and Green lines doesn’t need to know about track work done by Orenco, for example. 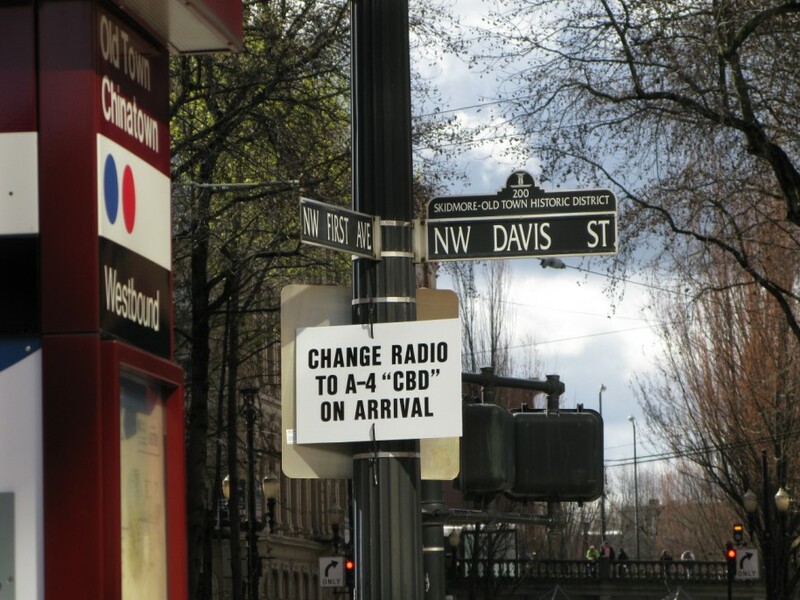 Originally there was one channel for mainline operations (Main 1), used from Gresham to CBD (Central Business District, aka downtown). 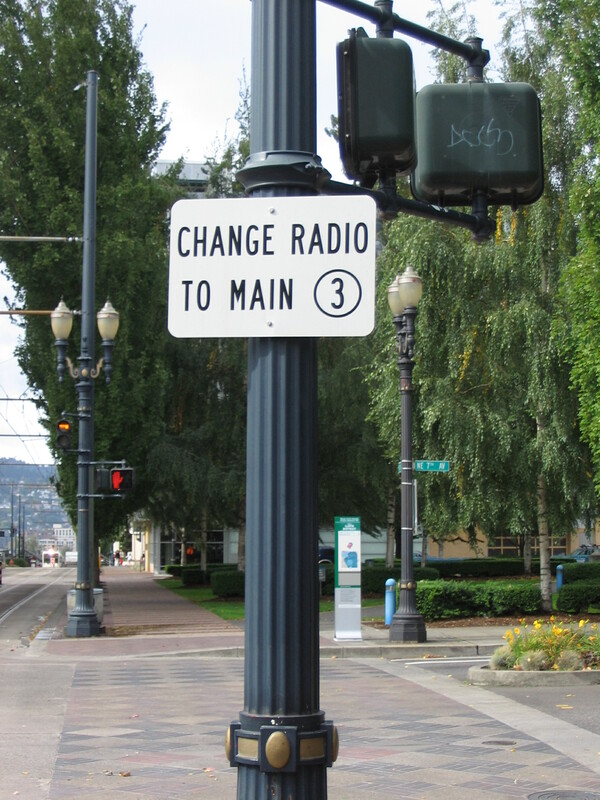 When the west side alignment opened in 1997, Main 2 was added and was the channel used from downtown to Hillsboro. When the Yellow Line opened in 2004, Main 3 was added, and it split the way the channels had previously been assigned, geographically speaking. 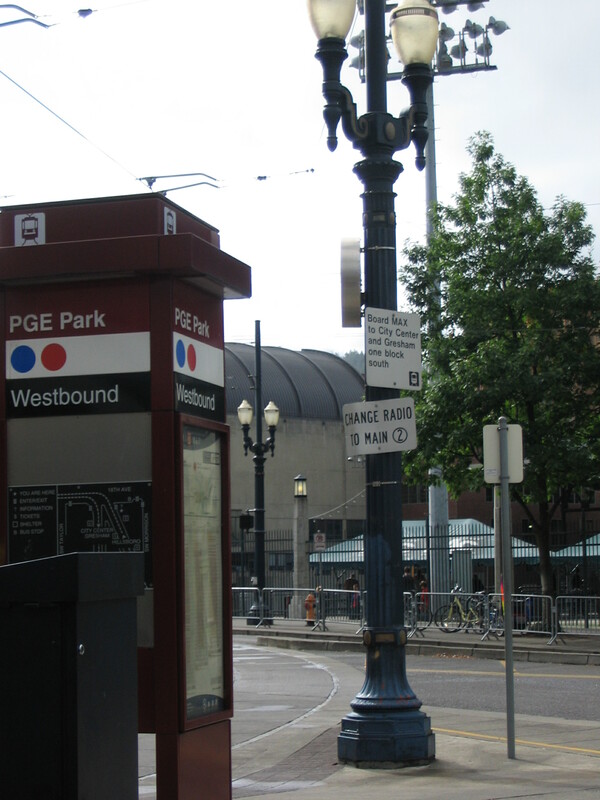 The following four pictures were taken in fall of 2008, after the Yellow Line opened but before the Green Line did. 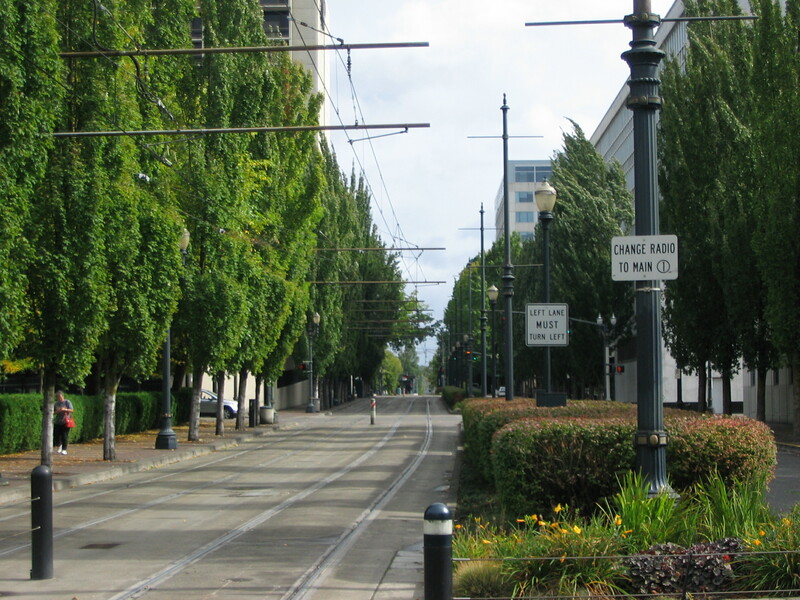 But then the Green Line opened, adding north-south trains downtown as well as a stretch of alignment to Clackamas Town Center, so the setup of radio channels had to be changed again. Those old Main 1 through Main 3 signs are no longer used. Currently there are four channels that are most commonly used for mainline operations (there are also separate channels for the yards and other less-frequently used channels for other purposes). 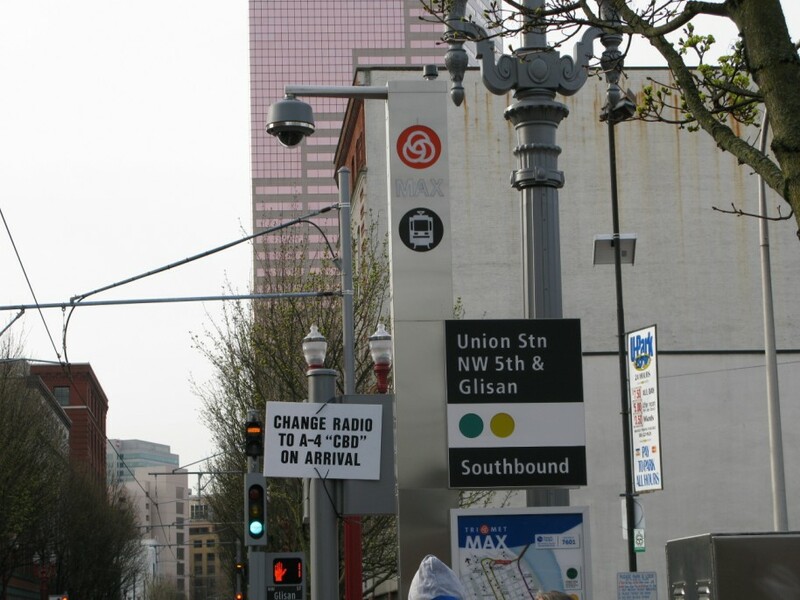 The 4 channels used on the mainline today (ignore the Streetcar on the map since it doesn’t use the radio that the MAX trains do, neither does WES which has been removed from the map). Click for larger version. In green on the above map, A-5 “West”, from Hatfield Government Center to PGE Park. 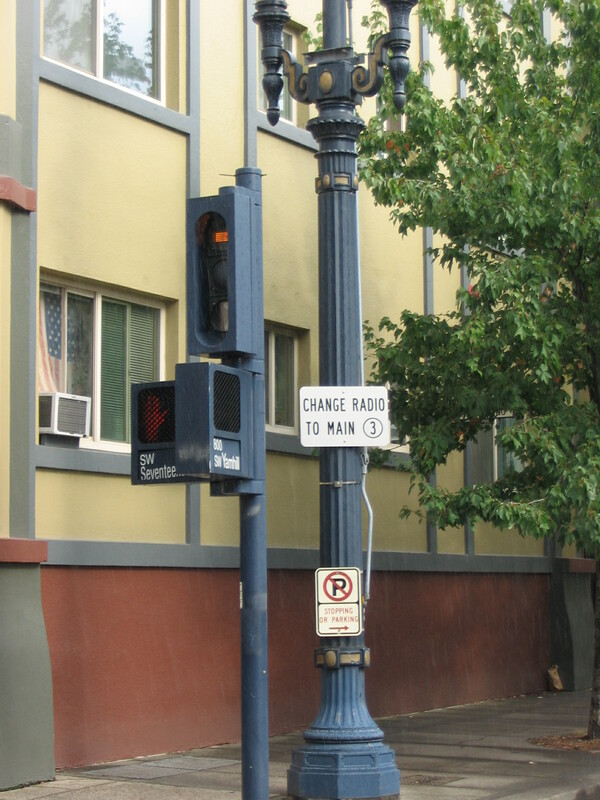 Edited, fall 2010 – the temporary signs have been replaced. I haven’t gotten pictures of all of them. The geographic boundaries haven’t changed, just the style of the signs. 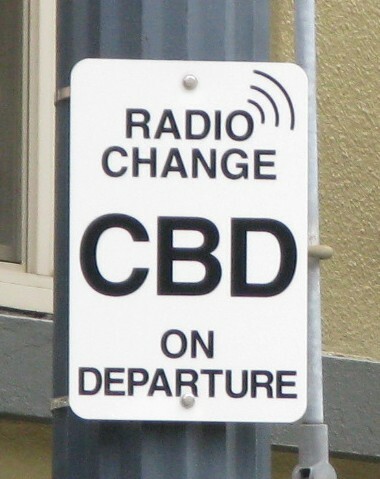 Because the broadcasts over the radio are open, anyone with a scanner can listen in. I don’t have a scanner and so I don’t know how to set one up to follow rail communications, but you can use an online scanner to get an idea of what it’s like. I’ve heard TriMet rail transmissions over OregonLive’s police scanner, so if you’re curious you can use that as a starting point. However, since that scanner follows everything, in addition to rail you’ll also hear police, fire, & EMS broadcasts, as well as airport parking shuttles and probably some other things that I can’t identify. I don’t know of any other free/easy way for the public to listen to radio broadcasts if that’s the sort of thing they’re interested in. In the cabs, the radio handset looks like a phone. It is not a phone. If you see a train operator using this, they are not on the phone. 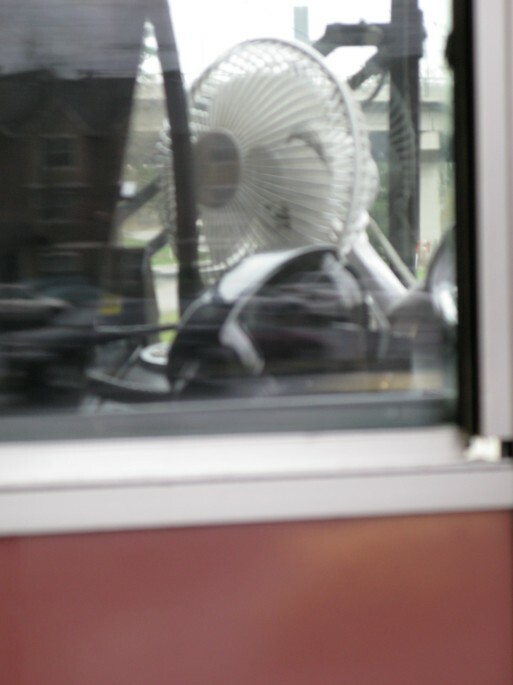 They are using the radio, which they are required to do, not using a phone while operating which is illegal.